OpenCart is a powerful open source shopping cart system that is designed to be feature rich and user friendly at an affordable cost with a wide range of OpenCart features. OpenCart is an ‘out of the box’ pre-developed shopping cart solution that can be utilised to produce a fully featured e-commerce solution at the fraction of the price of a bespoke ecommerce website, allowing you to trade on-line simply and effectively.This solution however does not suit all as some businesses require functionality that may sit outside of the framework of an off the shelf package and do require a fully bespoke solution. 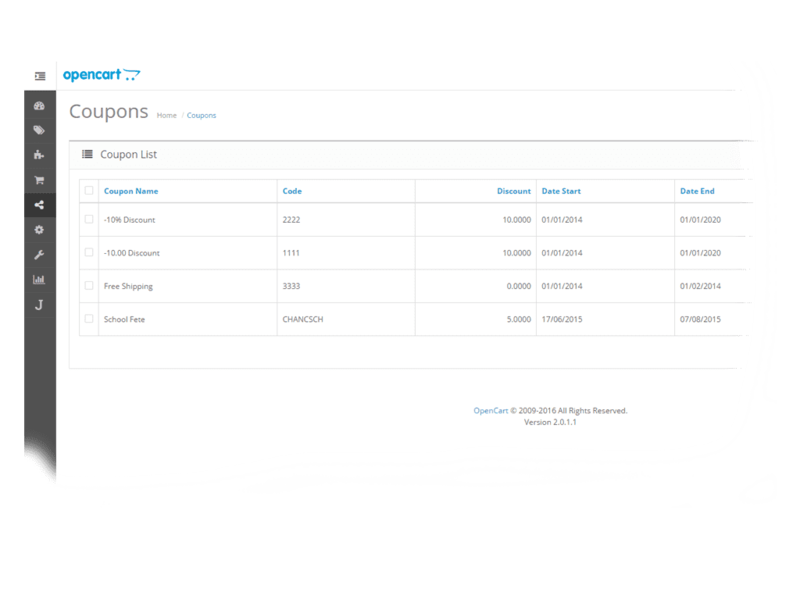 OpenCart 2.3.x is the latest version of OpenCart with key architectural changes that enable easier stable upgrades from older versions. OpenCart 2.1.0.1 is now launched in Beta is deemed to be the best yet, but is not fully stable and with many modules not yet updated for the version, so currently we would not suggest an upgrade quite yet. However many of the bug fixes have been made so hopefully it's not far off, but you tend to find that module upgrades take a little time to come along. When you first login to your mobile friendly admin OpenCart admin page you will see the most up to date information for your site, total orders, Customers, Sales, analytics and much more.. The easy to use menu structure also makes adding products and processing sales easy. 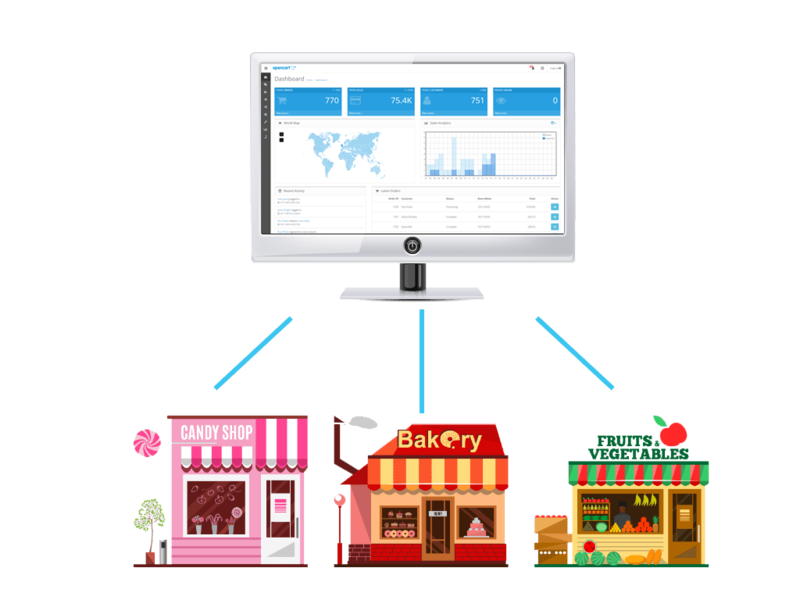 The ability to manage your store and who has access to what functionality within your business is important to many businesses. 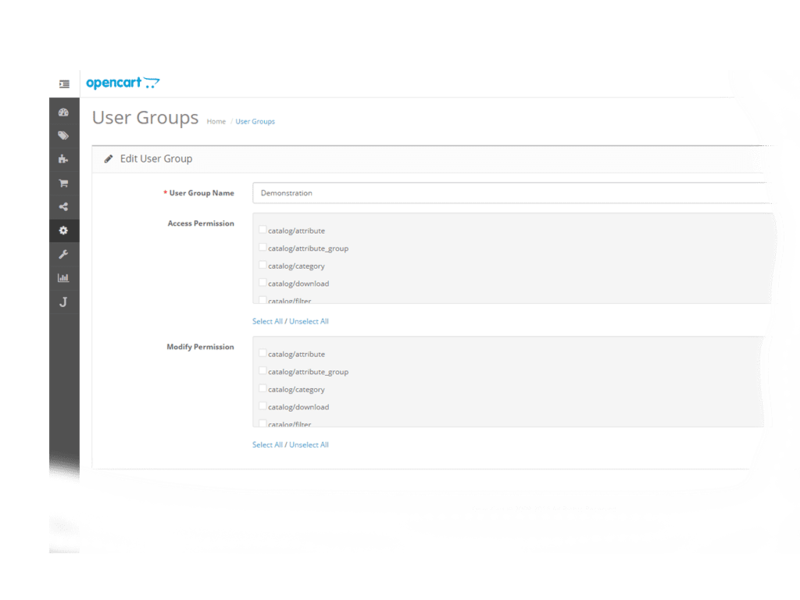 OpenCart allows you to create admin user groups and users and allocate what items within the website that they have access to. All products are different some are just standard, some require options such as a T-shirt will require size options and maybe colour options also. 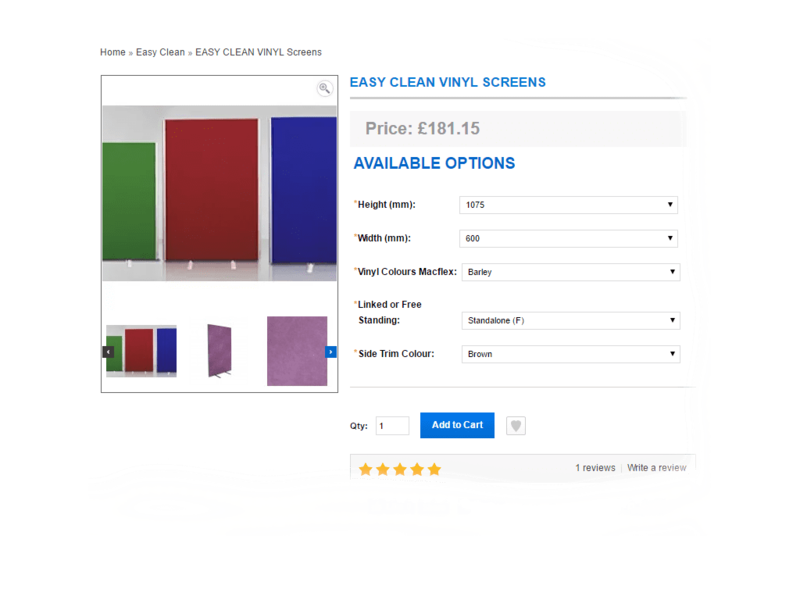 OpenCart offers the ability to create the options you require, colour, length, size what ever is required for your product variables. If your product are more complex and have dependent variables where the selection of an option creates a set of options based on the previous selection, including building a SKU code based on these options, then this can also be achieved with the addition of one of the many modules available. 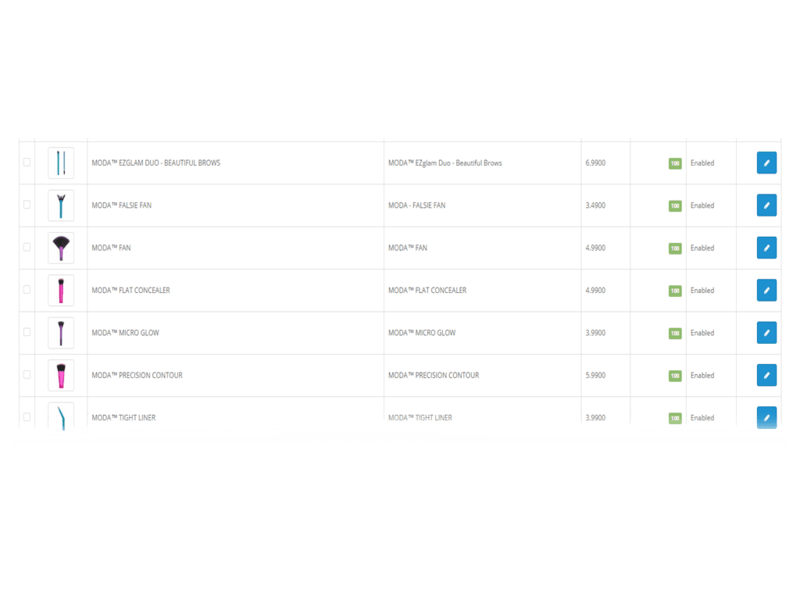 Do you want to manage multiple stores from one admin interface? Looking for the ability to have separate stores for separate brands so different products appear on different stores? OpenCart includes the ability to have multiple stores, using different designs, or themes also allows each store to have a different look and feel. OpenCart allows you add unlimited categories and subcategories and assign your products to these categories or multiple categories. Whether you have 1 products to sell or 100's of thousands of products OpenCart allows you to add as many products as you wish. You might only sell one brand or you may have many brands or products from different manufacturers. 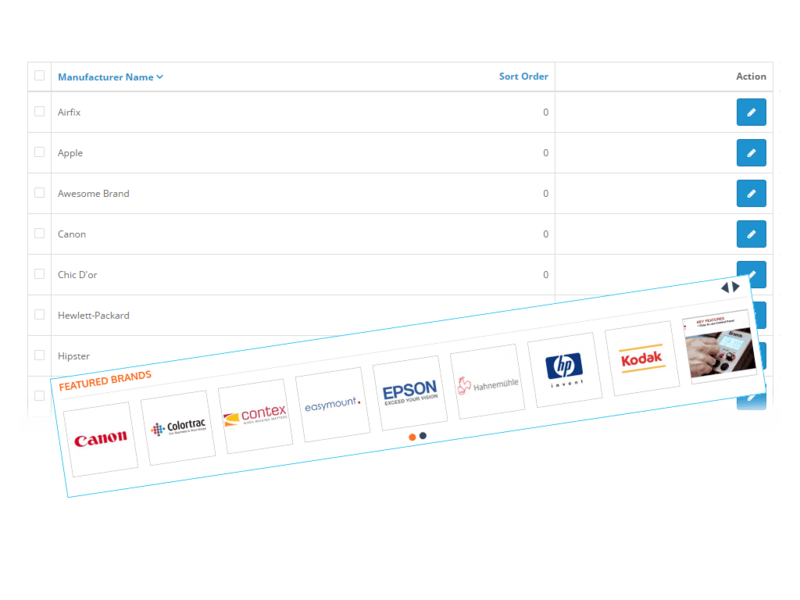 OpenCart allows you to create as many brands/manufacturers as you wish and then assign these to your products. One of the biggest growing areas of customer feedback, SEO and improving sales is buy featuring customer product reviews. these will often help a potential customer to decide if they will buy or not. OpenCart comes with a powerful integrated review and rating system. One way of increasing customer retention and repeat sales is by rewarding customers that buy by encouraging them to return by giving redeemable reward points. OpenCart includes a reward points system as standard. 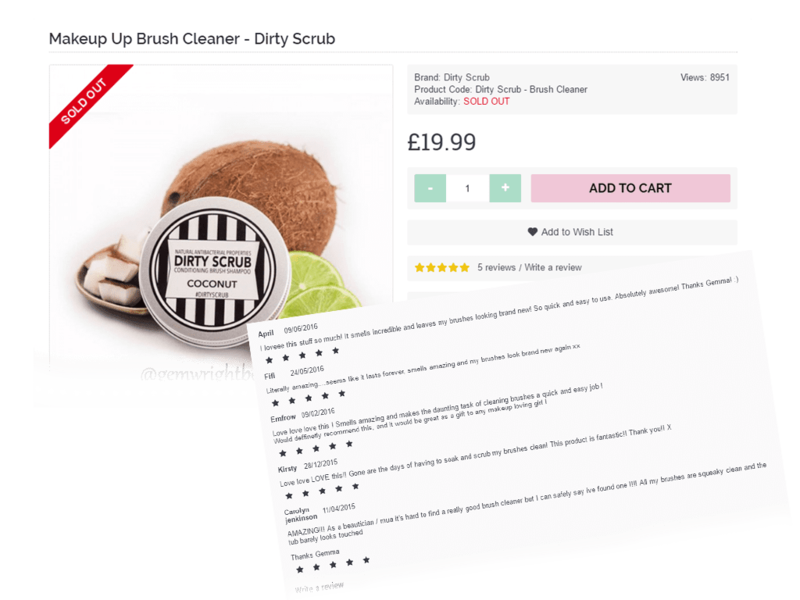 Allowing customers to find products by refining their search using filters is useful when it comes to narrowing a search. Filters can be created in the same way as you create categories. Giving customers the opportunity to view your website in their native language can be useful, although it will take you time to add your translations for each language. By adding additional language modules you will then have the ability to add additional translations for the required languages. You choose your required currencies, £'s, Euros, $, yen, any currency, anywhere in the world. Rates are automatically updated daily and you can also set-up different taxes. OpenCart comes with a large number of shipping partners and methods available out of the box including Citylink, FedEx, Parcelforce, Royal Mail, UPS and many more. There are also methods such as Free Shipping, Flat Rat, Collect From Store, per item also included. If you require others or require more complex shipping methods there are many modules available from the marketplace. OpenCart comes with many payment gateways out of the box and there are many more modules available for additional payment gateways. 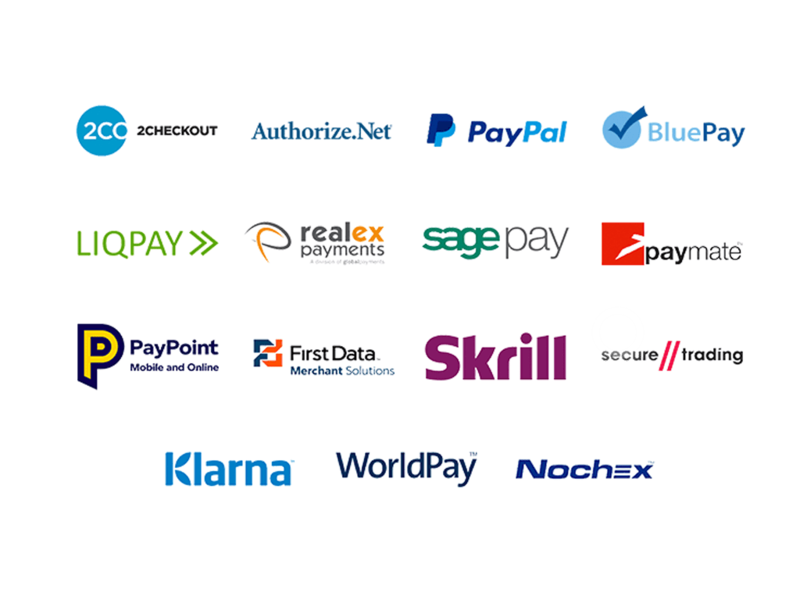 You can choose from 36 Payment methods that come integrated with OpenCart or install many more available from the OpenCart marketplace. If you are looking for a system that allows for recurring payments, subscriptions to magazines, members discounts or club membership you can use this functionality to charge for your products or services. 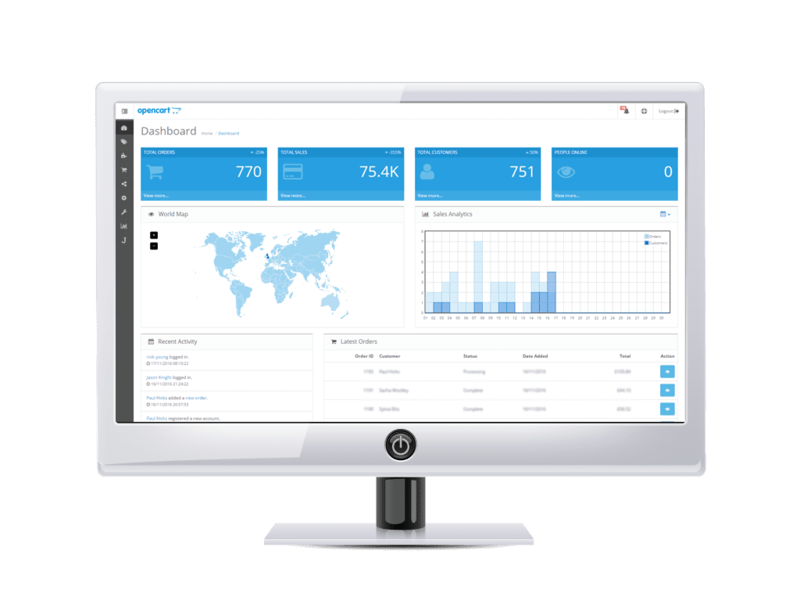 OpenCart comes with some sales reporting as standard allowing you to view sales reports, purchased products and viewed products. There are many additional reports available from the marketplace that can be downloaded and installed. There are 100's of modules available from the OpenCart market place that will give you additional functionality to suit your product offering. If the functionality you require is not available and you require something more bespoke such as a more unique tailored product builder then Tristar can build this functionality for you. The OpenCart Marketplace features over 13,000 modules and themes to help grow and expand your OpenCart website for both admin ease of use and for the customer. Every business is different and sometimes the functionality you require to make you stand out from your competitors may not be available or a module will only partly do what you need. In this instants Tristar are happy to discuss your requirements and can create bespoke functionality for your website that still allows for the ability to manage the process, products and complex pricing tables and algorithms. OpenCart 2.x onwards is responsive as standard, this means that you can administer your website easily from a mobile device with no need to pinch and pull. Using the right theme or having a bespoke responsive design created will also mean that the site will be fully responsive front-end improving the user experience and improving your SEO ranking. You can connect to Google Base (Shopping) and with OpenBay Pro feed your products into Amazon, eBay and Etsy. Managing stock-levels across multiple platforms both on and offline as well as managing and streamlining your shipping methods is essential when it comes to improving workload and profit margins. As a result many companies are looking to integrate with Epos systems, CRM systems and external shipping companies or third party providers. It is important to SEO optimise your site and products for Google and other search engines. 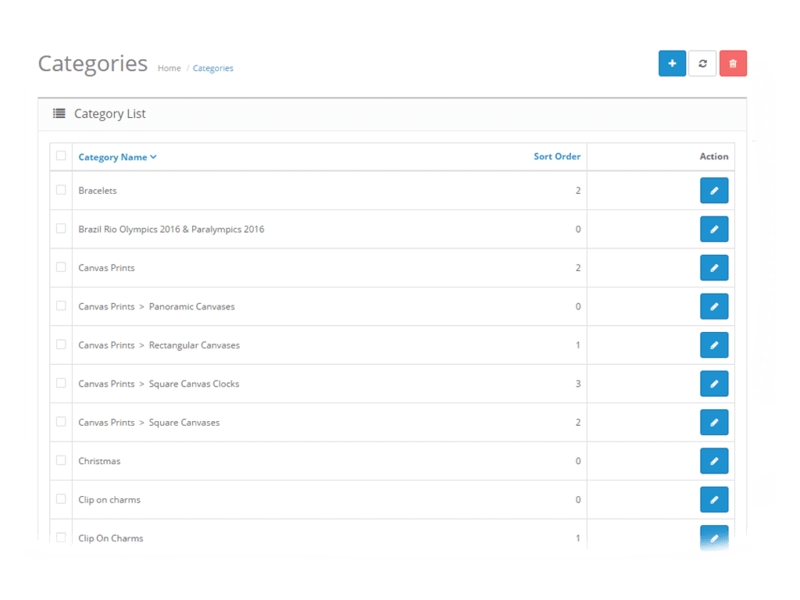 OpenCart gives you the tools to do this when you create your categories and products with Meta Titles, Meta Descriptions, Meta Keywords, Alt Tags, SEO URL's, canonical's and site maps. There are also many additional modules available to help you with making sure you follow the rules and to look at all the additional areas that Googke now wants to see. There are features available in OpenCart that help you to market your products with reports on viewed products, reviews, best sellers, featured products, coupon codes and more.